January is Oatmeal Month, celebrating the warm, soft porridge made from (you guessed it) oats. Now, let’s get this out of the way. Oatmeal does sometimes get a bad rap. It’s viewed as the celery of the breakfast world: a healthy but ultimately boring mushy mass next to your granola parfaits and poached eggs. But we’re going to let you in on a little secret: oatmeal might actually be the best breakfast dish in the whole world – and here’s why. It might not be as glamorous as quinoa, couscous or other trendy grains, but when you get down to nutritional brass tacks, it’s hard to get better nutrition per calorie than regular, old oatmeal. Oats contain more protein and fibre per 100 grams than wheat and corn, and are loaded with B vitamins that boost your metabolism and help your body produce energy for the day. Of course, oatmeal is still a carbohydrate-based meal, so take that into account if you’re on a low-carb diet. But for people seeking the healthiest possible macronutrient balance in their breakfast, oatmeal reigns supreme. First, a little oat vocab. In some English speaking countries, including the UK, “oatmeal” means an ingredient made from dry oats, either rolled, steel-cut or ground (more on that later). In other countries, including the USA, “oatmeal” to the soft, cooked dish made from dry oats (which the Brits would call “porridge”). Still with us? Now for the kitchen wisdom: Whether dry or cooked, oatmeal is remarkably easy to work with and prepare. Wheat, corn (other than basic cooked kernels) and other grains usually require more processing at the factory and even more preparation in the kitchen before you can enjoy scratch-made biscuits or cornbread. Cooking oatmeal is relatively simple. Just simmer it with water, milk or some combination, add a little brown sugar and cinnamon, and presto! The perfect breakfast in just a few minutes. No yeast, no baking soda, no fretfully watching the oven for signs of impending disaster. In fact, you can skip the cooking altogether if you want. Dry oatmeal is usually soft enough to sprinkle in a little yoghurt salad, adding a touch of fibre and texture. Oatmeal is often bashed for being “bland”, and this may be true when eaten on its own. But its understated, neutral flavour means that brown sugar, honey, fruit, yoghurt and even coffee or matcha powder can totally change the flavour of the dish. There are simply a lot of ways to enjoy your oatmeal. But be careful: people often load up their “healthy” oatmeal with brown sugar, honey or maple syrup (which still contains a tonne of sugar, even if it sounds better for you than corn syrup). Like fruit juice, parfaits or yoghurt bowls, if your “nutritious” oatmeal tastes too sweet to be true, it probably is. Instead, go lighter on the brown sugar and honey and use blueberries, raisins and cinnamon for a flavour boost. Like wheat flour, you’ll spot a few varieties of dry oatmeal on the supermarket shelf. These usually have to do with the processing technique rather than the species of grain. Steel cut, as the name implies, has been chopped into tiny pieces with steel blades, whereas rolled oats (or “old fashioned” oats) are squashed flat and lightly cooked, giving them them the classic, flakey oat shape. 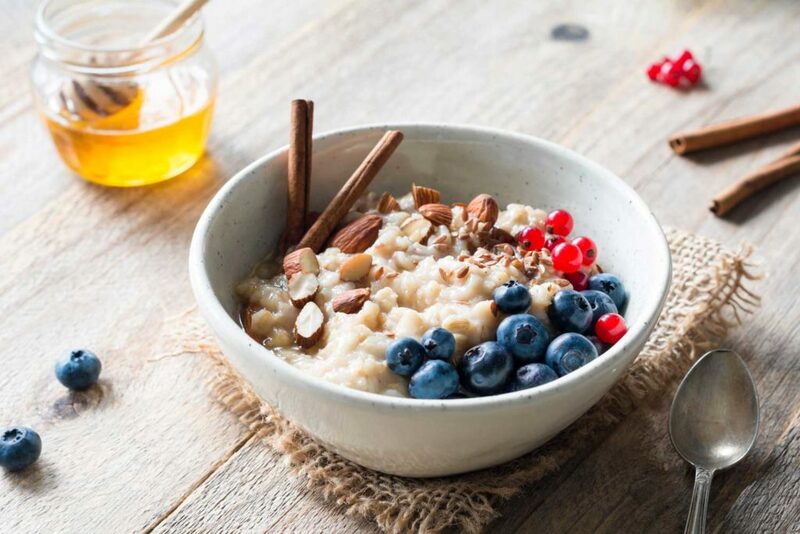 Nutritionally, steel cut oats have slightly fewer calories by volume than rolled oats and usually retain more of the bran, giving them a little more fibre and protein, whereas rolled oats absorb water better and have a smoother texture when cooked. “Quick cooking” oats are rolled oats that have been chopped into smaller pieces, helping them to cook faster. “Instant oats” have been pre-cooked and dried, making them cook even faster. Theoretically, these differ only in texture and consistency, and not nutrition. However, manufacturers often add artificial sweeteners and preservatives to instant oats, so be sure to check the label and opt for the “plain” version.